After not being able to work on the rocker for the past 2 weeks, it felt good to get back in the shop this weekend to continue making progress on it. I started by milling the board that will become the front legs down to 1 3/4" thick. Next, I started ripping the board into 1 3/4" strips on the table saw to create square front leg blanks. Only a few inches into the first cut, I could tell that something wasn't right. It was really hard to push the board through the blade, so I shut down the saw mid cut to check things out. I thought that my feather board might have been set too tight, so I adjusted and tried making the cut again. This time, I got a little further into the cut, but again something just did not feel right and it was way too hard to feed the stock through the blade. I shut down the saw mid cut again and lifted the board off of the table. When I lifted the board up, I discovered the issue. This particular board had some built up tension that was being released when I started ripping it; which caused the kerf to close up and pinch the blade. Thankfully I had a splitter installed on my table saw, so instead of the board pinching the blade and kicking back in my face, it just pinched the splitter and allowed me to safely shut down the saw without incident. I'm super thankful that I made the $40 investment in a MicroJig Splitter; much cheaper than a trip to the ER! 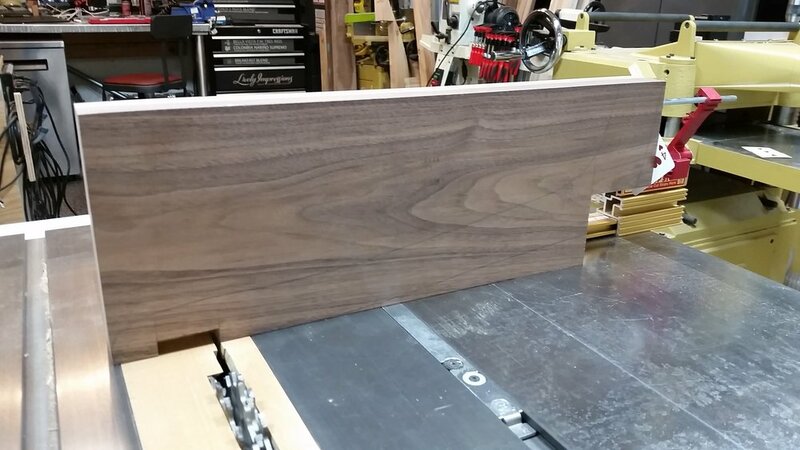 To avoid the tension issue in this board, I ended up ripping the board to rough widths on the bandsaw; then cleaned them up on the jointer and table saw. Here's the front splitter pinched in the kerf of the board. There was so much tension in the board, I had to jamb a shim into the keft to spread it apart enough to pull the splitter out! Cross cutting the front legs to length with the miter gauge. Next, it was time to start cutting some dados for the front leg joinery. After installing a 3/4" dado stack, I was ready to go. 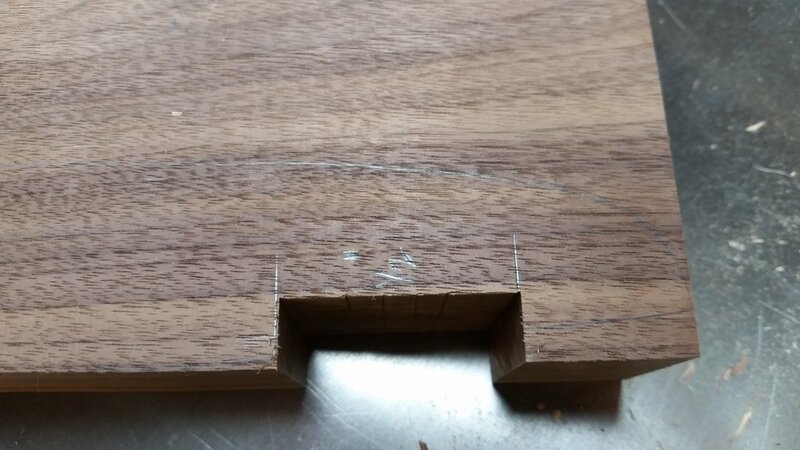 Using the miter gauge and flip stops, I was able to cut the dados in exactly the same location on each of the front legs. Matching dados cut in the front leg blanks. Next, I needed to cut dados in the edges of the two outside seat boards, which will accept the dados I cut in the front legs. If you look closely, you'll see that I had my setup a little off on the flip stop, so the pencil mark is still visible on the left side. Rather than trying to adjust the flip stop, I simply added a playing card to act as a shim between the board and the flip stop. This made my dados just a hair wider, which gave me a perfect fit. Here's the front legs fitted onto the outside seat boards. It's starting to actually resemble a piece of furniture! Front legs fitted into the seat dados. Closeup of the front leg joint. Seat boards and front legs with dados cut. 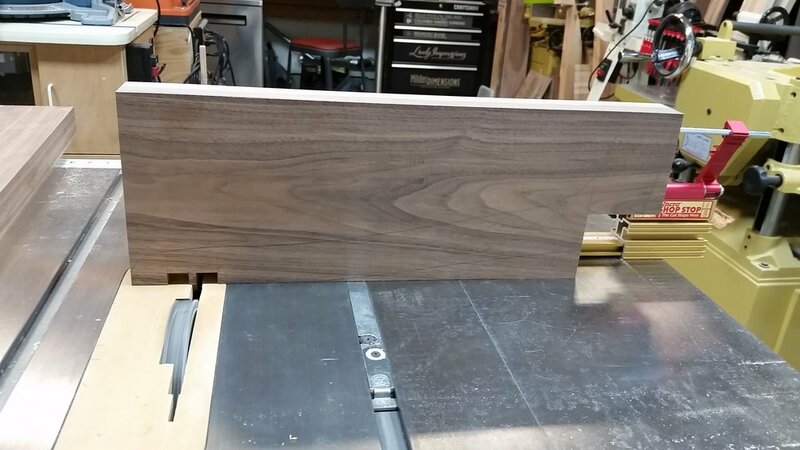 Next, I'll need to build a jig to cut the dados in the rear legs. 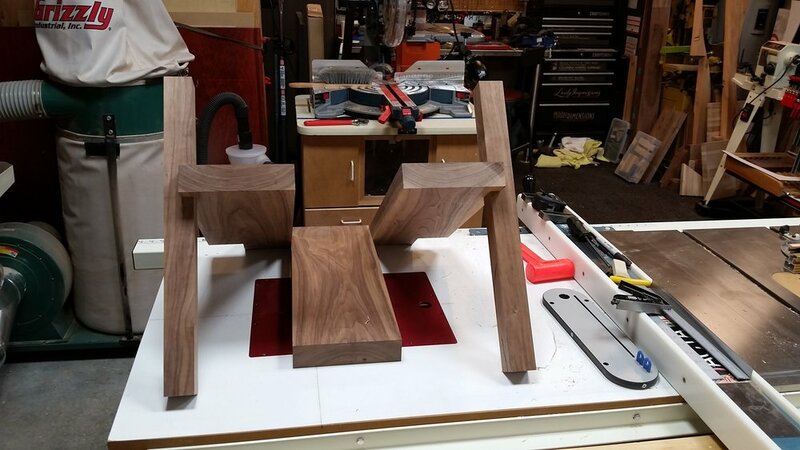 Since the rear legs are curved, it would be next to impossible to cut dados in them safely without a jig. After I get the dados cut into the rear legs, I'll cut tapers into both the front and rear legs to give them a little stylistic character. I'm super happy with the progress I've made so far. There's still a lot of work left to do, but it feels good to see the chair actually starting to take shape!